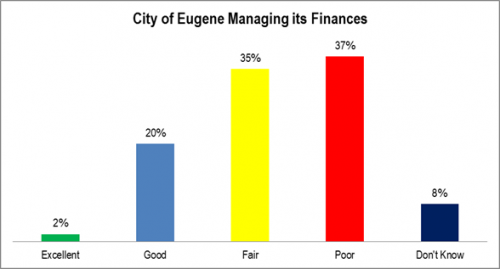 Eugeneans think Eugene is doing a better job managing its finances than Lane County is (see earlier post). However, there isn’t that much of a difference. QUESTION How would you rate the job the City of Eugene is doing managing its finances: excellent, good, fair, poor? 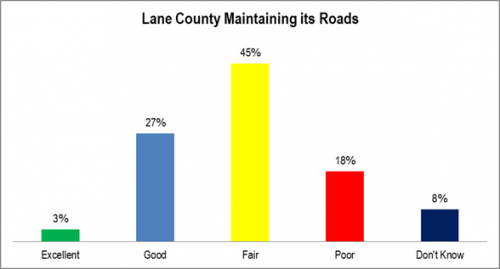 Lane County is doing better with its roads than its finances, but not that much better. Of particular note is that the “Good” percentage is greater than the “Poor” percentage. QUESTION How would you rate the job Lane County is doing maintaining its roads: excellent, good, fair, poor? Eugeneans don’t think the county is doing such a good job managing its finances. Zero percent rate it excellent. 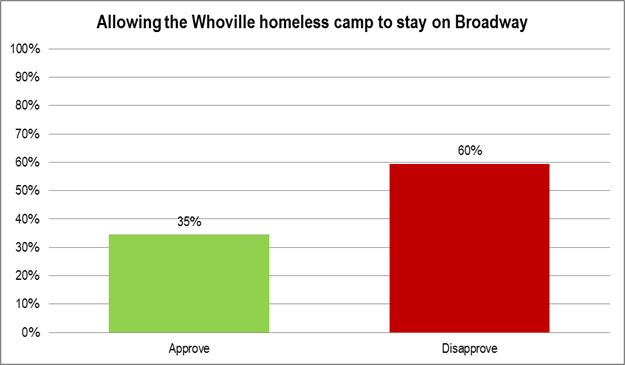 These figures are equivalent to a 13 percent approval and 75 percent disapproval. 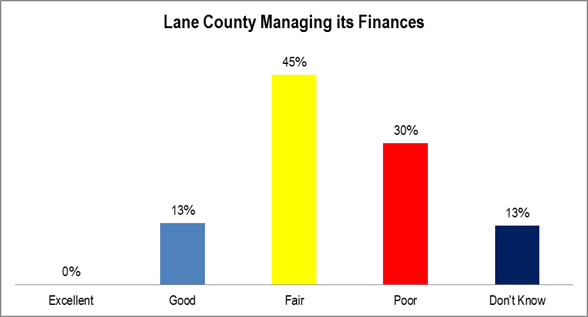 QUESTION How would you rate the job Lane County is doing managing its finances: excellent, good, fair, poor? 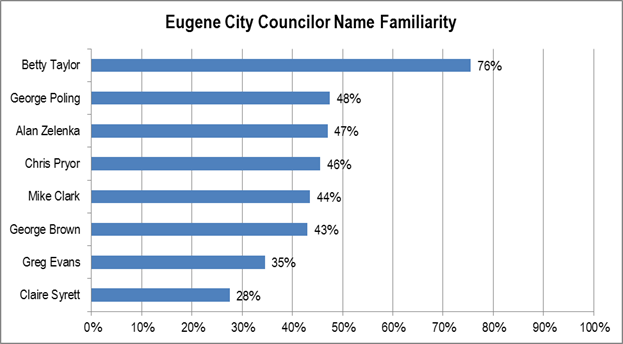 There was a big increase in name familiarity among city councilors in this survey. 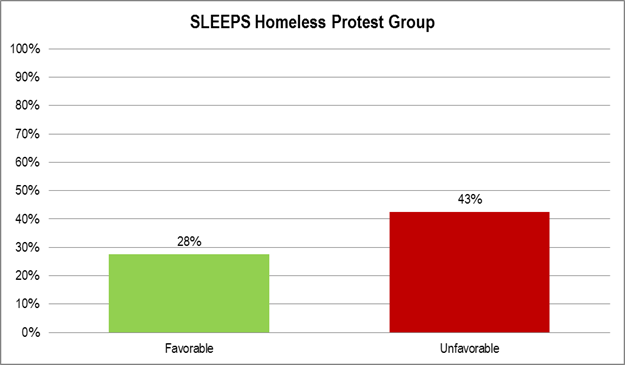 There has often been an increase in the February survey, but this was larger than most and affected more councilors. Of course, now that Pat Farr has been promoted to the county commission, Betty Taylor has the clear lead in name familiarity. Eugene Divesting from Fossil Fuel Companies? 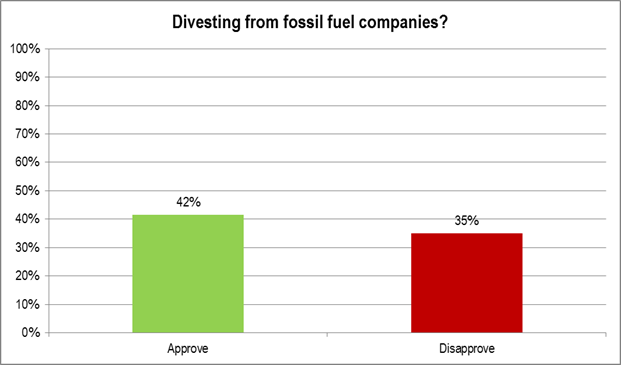 There is narrow approval for divestiture. However, first, the total approval is well under 50 percent: there is no solid majority. Second, the undecided is well over 20 percent: respondents have very little information about this. QUESTION Do you approve or disapprove of the City of Eugene divesting from fossil fuel companies? Category: Eugene and Lane County, Oregon, Political | Comments Off on Eugene Divesting from Fossil Fuel Companies? There is moderate approval of making mandatory the currently voluntary carbon emissions goals. 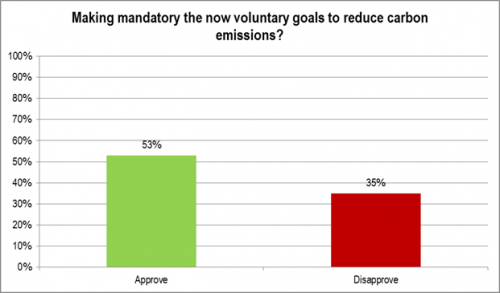 QUESTION Do you approve or disapprove of the City of Eugene making mandatory the now voluntary goals to reduce carbon emissions? This should be no great surprise. 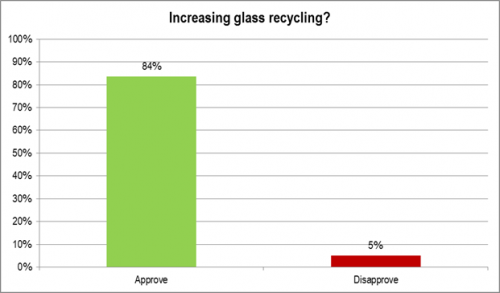 There is a high approval level for increasing glass recycling. QUESTION Do you approve or disapprove of the City of Eugene increasing glass recycling?